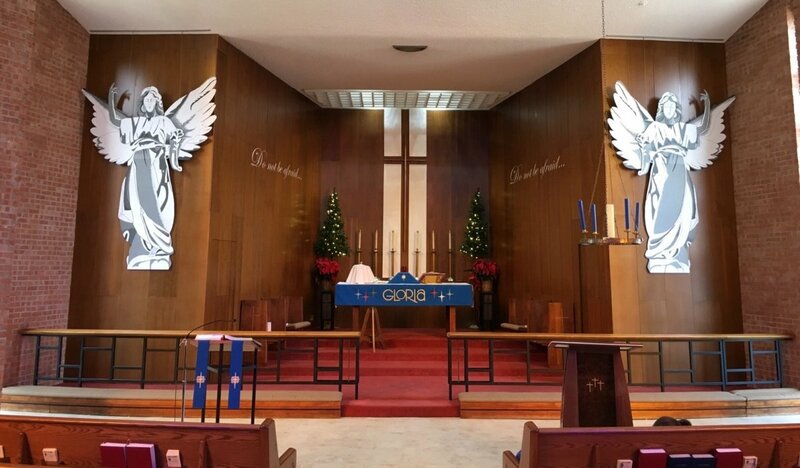 Our church has a group whose job it is to decorate the sanctuary for the holidays, both Christmas and Easter, and their precursor seasons of Advent and Lent. 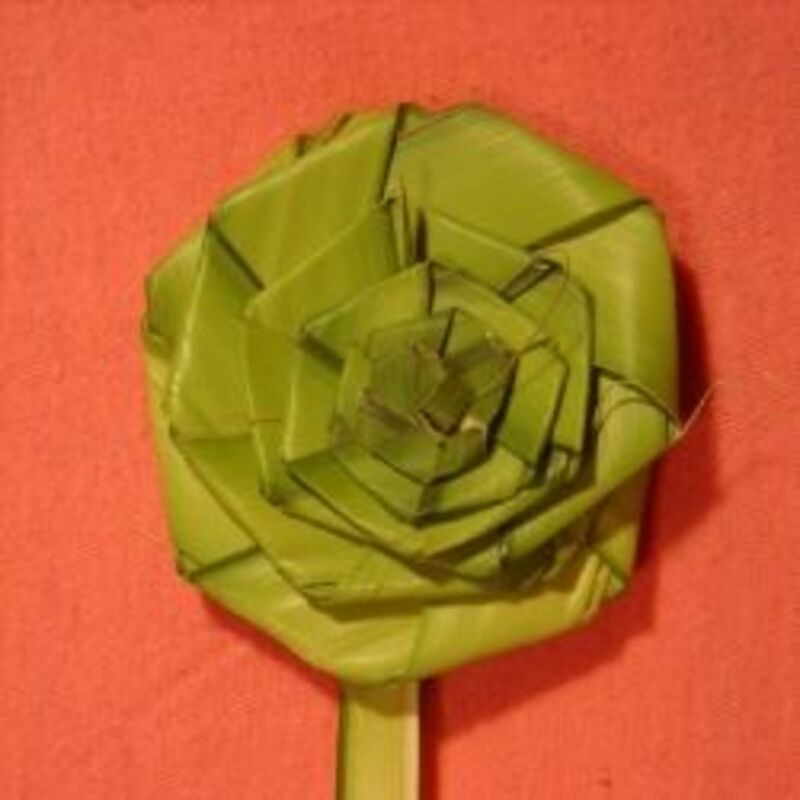 Well in advance of each season, we meet and devise a design to accomplish this task. For this particular Easter, we chose the image of a butterfly, because its life cycle is a perfect symbol for the life, death, and resurrection of Jesus. 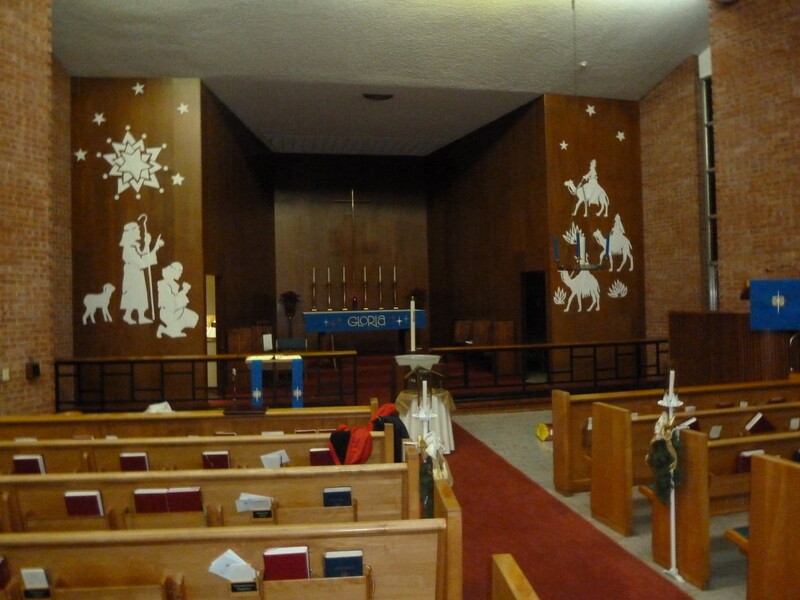 Our church is a large, mid-century modern design with high brick and dark-wood-paneled walls. This design provides the perfect backdrop for large, colorful decorations. If you would like to create a similar project, you can scale the image to fit your worship space. This is the drawing upon which our display was based. In addition to deciding on the image of a butterfly, we also decided we wanted to emulate and celebrate the ancient art of mosaics in our display. This creation was going to hang on the wall of our church, so we obviously couldn't create an actual mosaic due to the weight. We arrived at the idea of using small bits of paper to substitute for the chips of stone or ceramic that would be used in a mosaic. 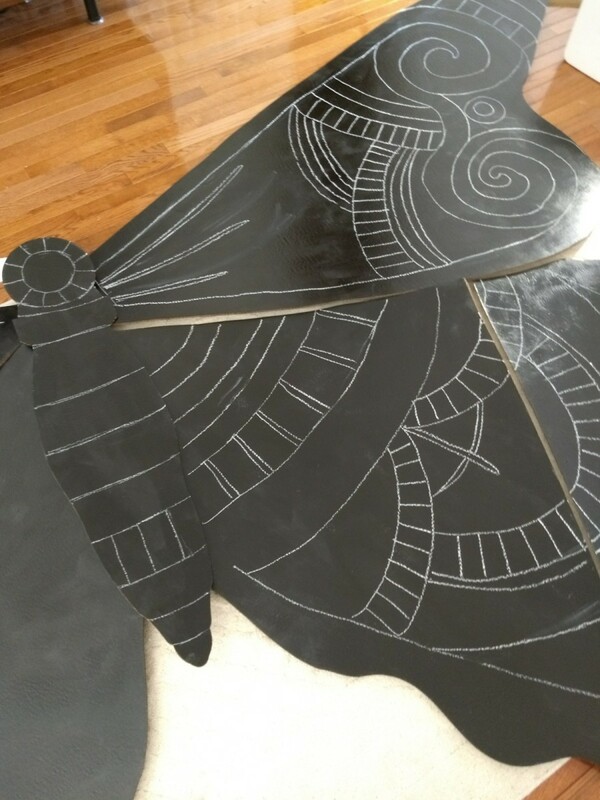 Our plan was to glue the paper bits on a dark painted cardboard butterfly. 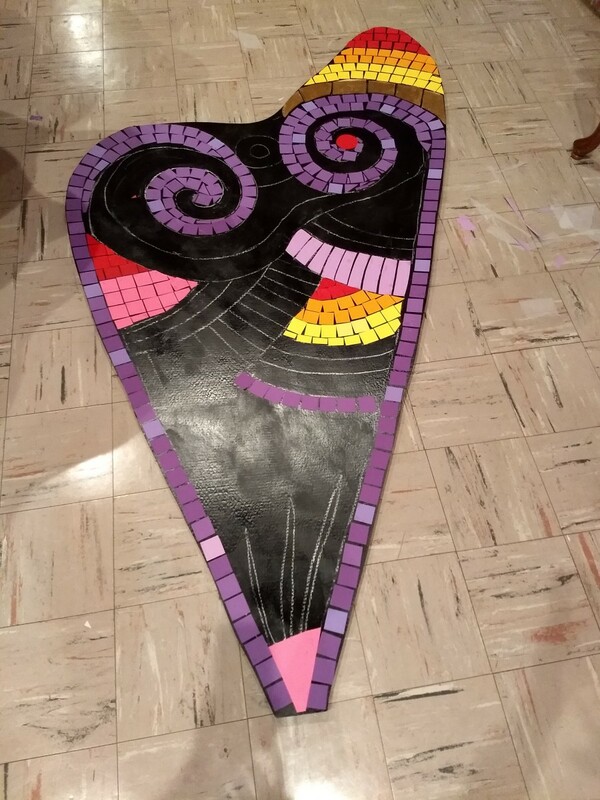 The dark cardboard surrounding the colored paper would serve to replicate the grout around the mosaic pieces. 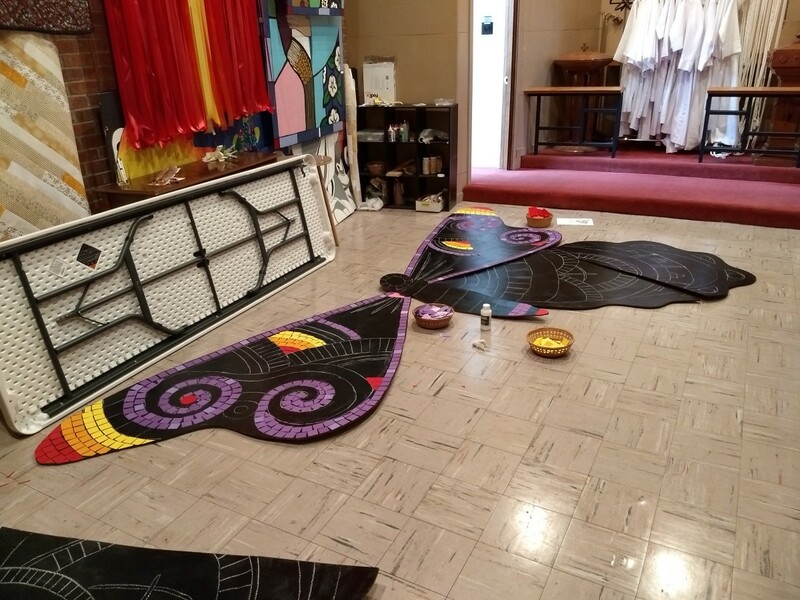 This large butterfly was constructed in pieces to aid in production and the decorating process. 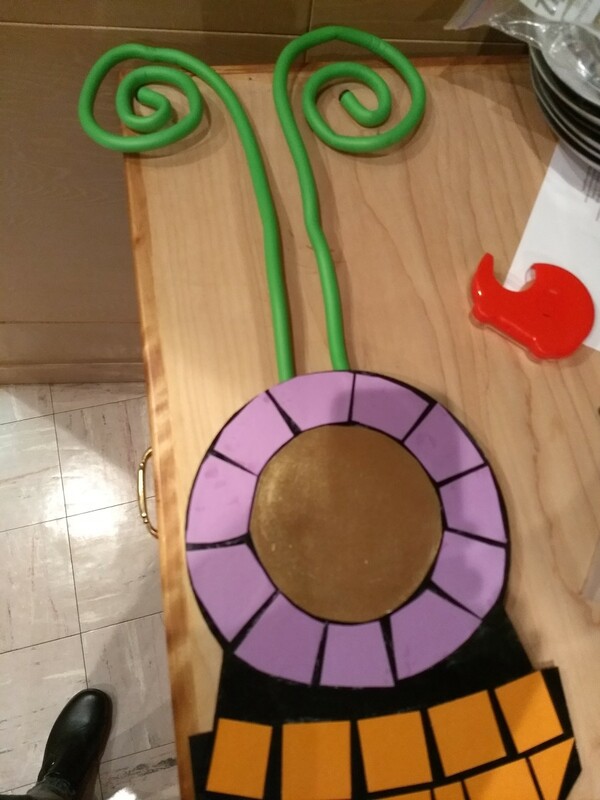 Because we have a limited budget to create our displays, we try to use inexpensive (and when possible) free items. 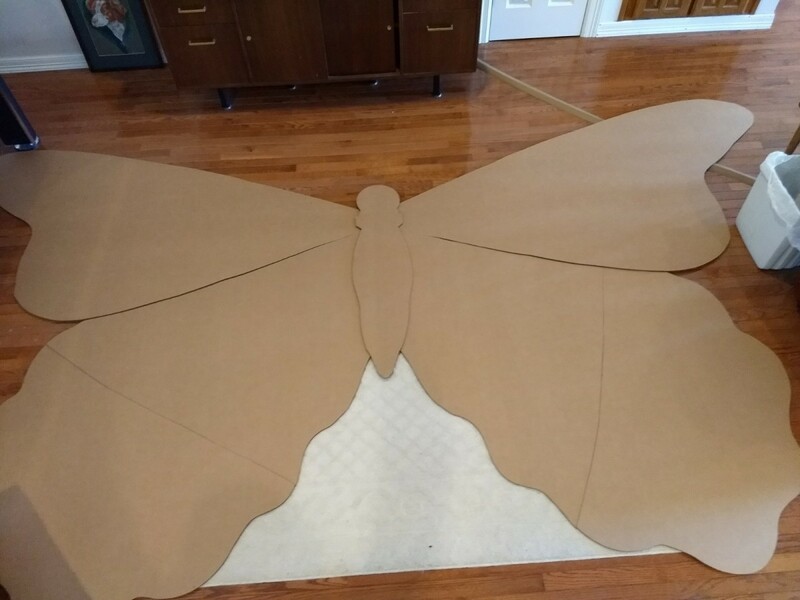 We decided to create our butterfly from cardboard. Our space is large, so we designed our butterfly to fill one brick wall. 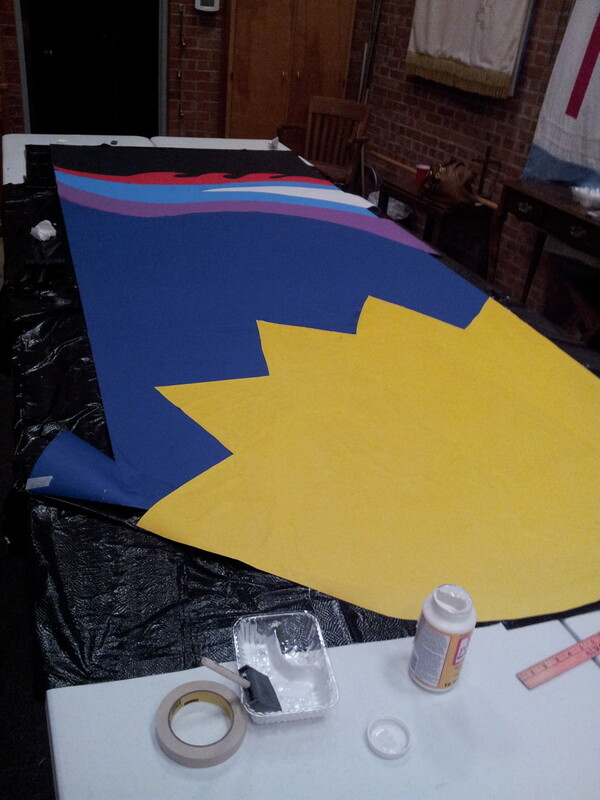 We knew our mosaic theme was going to be labor intensive, so we decided to only create one large butterfly. 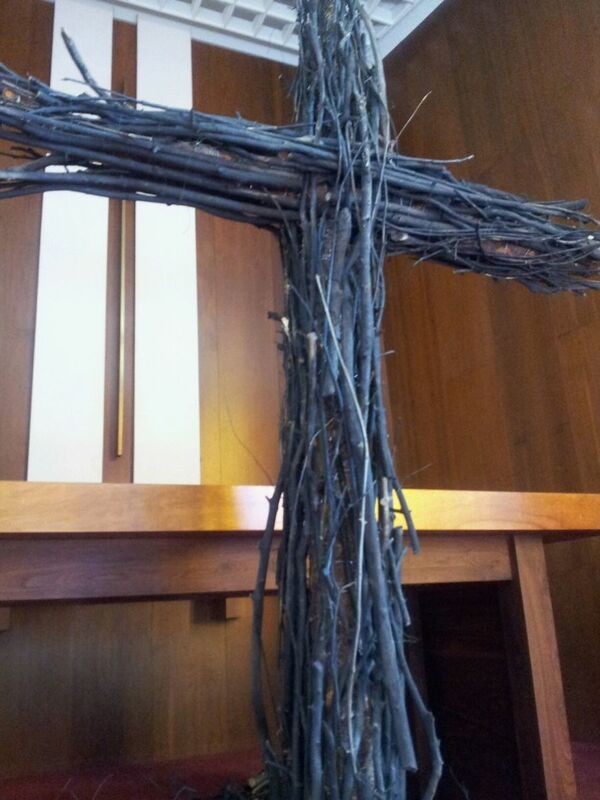 During this time we were lucky to have a fellow church member who worked for a cardboard fabrication company. 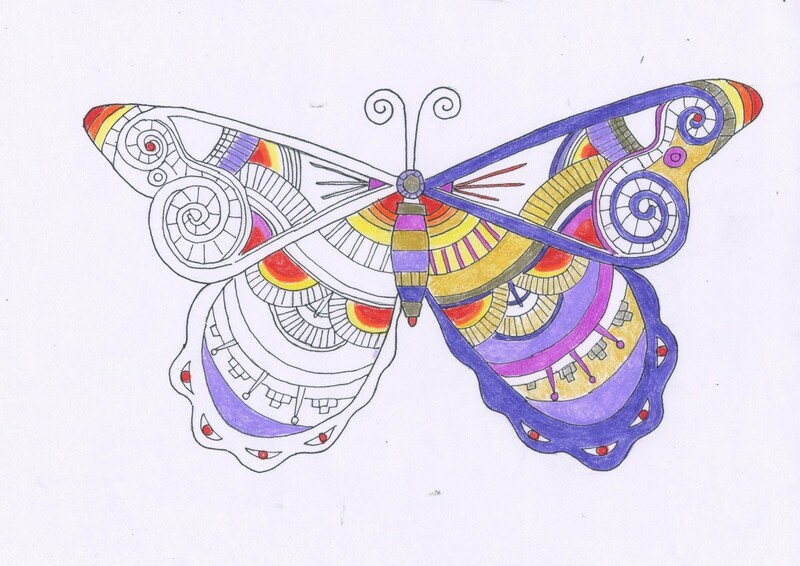 She was able to use our base drawing and create the pieces of the butterfly to the scale we wanted. This step could pretty easily be done by drawing the shapes you need onto the cardboard and cutting them out with an Exacto knife. 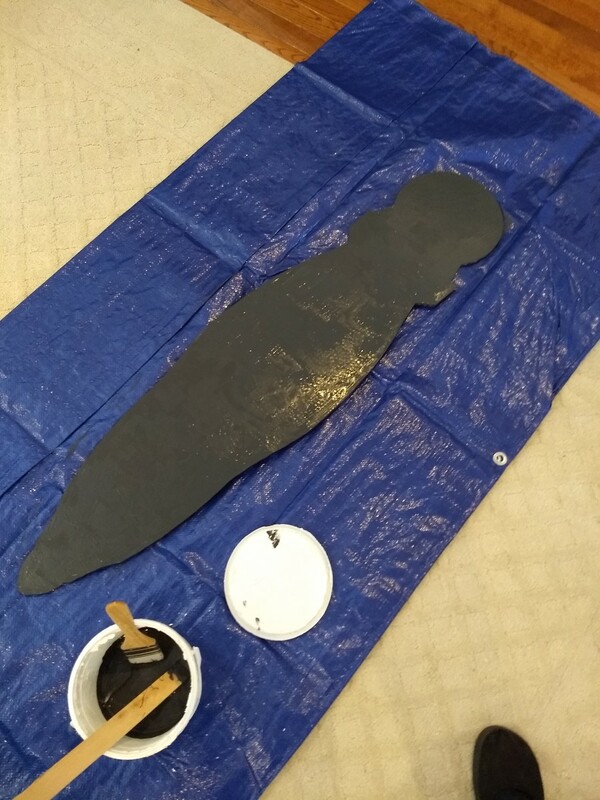 The cardboard was painted with a dark gray/black acrylic house paint. 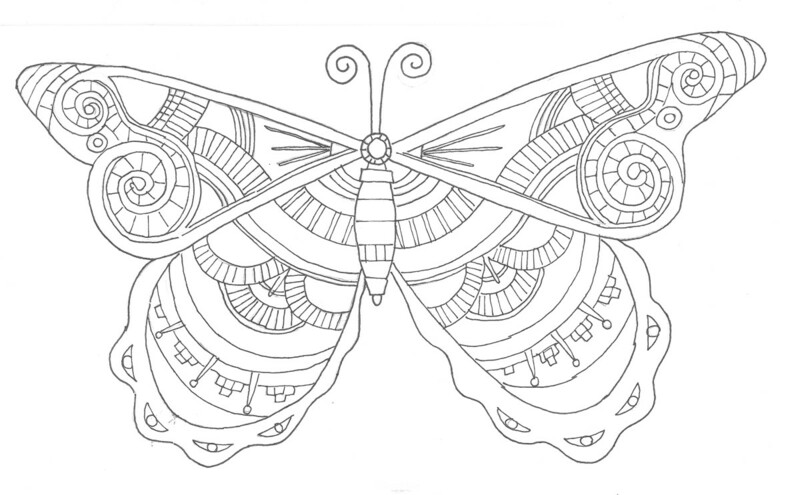 Once the butterfly components were painted black, we were ready to put the design for the "mosaic" onto the cardboard. To do this, we arranged the butterfly parts the way it would be when it was built to help make sure the design "flowed" properly and the design was (more or less) symmetrical. The design was hand-drawn onto the cardboard with chalk. See photo below. Once the design was drawn on the cardboard pieces, they were ready to add the colored bits of paper to represent the ceramic or stone tiles in an actual mosaic. These pieces of paper were cut from various colors of paper and followed roughly the color study shown below. This is the color study used to give our workers a "road map" for placing the paper pieces. Colored paper being placed onto the cardboard base. The small pieces of paper were adhered to the cardboard with plain white paper glue, one at a time. We used the chalk outlines to guide us in the placement of the paper "tiles." Most of the pieces of paper were cut into small squares, but others were cut in more random shapes and triangles to fit different areas of the design. This was a painstaking and time-consuming process, but with several of us working together, it was never burdensome. Our team finds this kind of work enjoyable. With our hands busy with a creative project, we have great conversations about almost anything. We found some electric cord ties in a lime green that worked perfectly for the butterfly's antennae. Once all the paper "tiles" were in place we were ready to construct and hang the final piece. 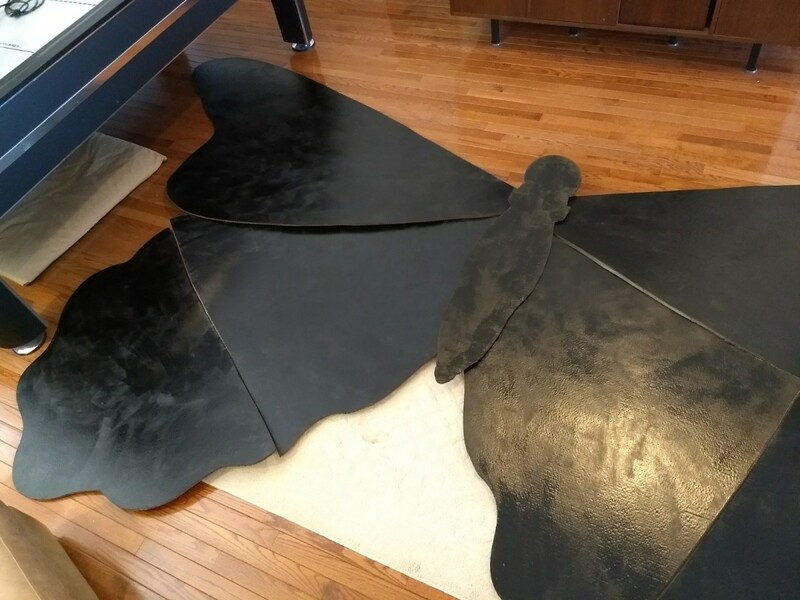 The butterfly was so large it had to be transported out of our workroom in pieces. We constructed the butterfly by taping the pieces together along the joints in the back using strong duct tape. Grommets were driven through two pieces of cardboard and attached to the back of the butterfly about midway along the top of its wings. The butterfly was suspended by wire from the grommets to the ceiling and set at a jaunty angle. 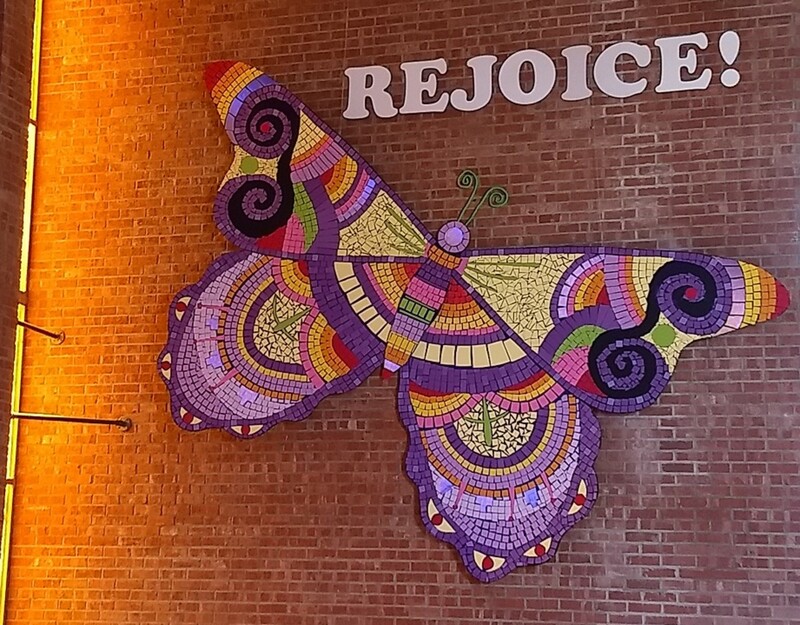 The overall image was completed by taping letters spelling out "Rejoice!" to the brick wall beside the butterfly. The final display is shown below. This project was such a rewarding experience! 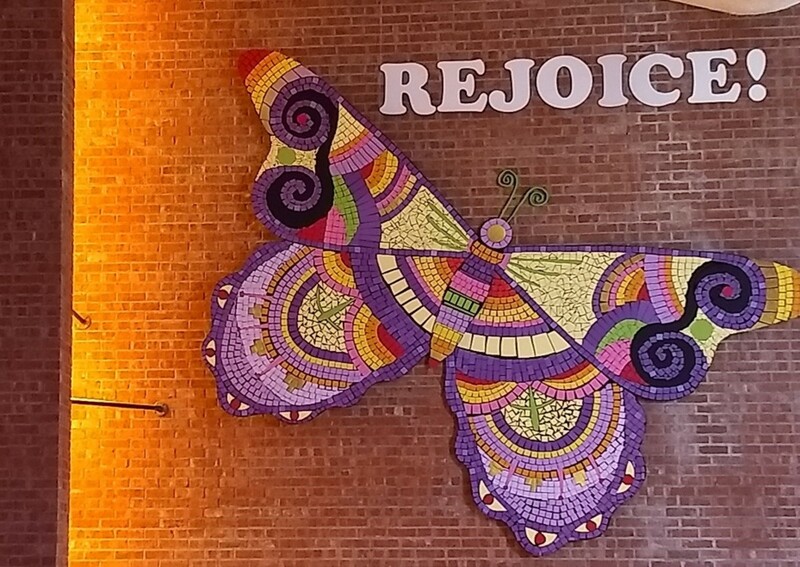 Our team really enjoyed making this butterfly, and we think the congregation appreciated this beautiful, vibrant echo of the joy of Easter. If you are inspired by this article to try a similar project for your church, I would advise you to make sure you get an early start! This display took our team approximately 6 weeks to complete. Of course, you may be able to devise some short cuts or to use a smaller-scale design. Whatever the case, I hope you enjoyed this article and that you will consider a similar project for your place of worship in the future. A description of the thought process behind each of our displays is always published in the church bulletin. The following is what we chose to say about this display. This Easter’s display is inspired by the ancient art of mosaic in which broken bits of pottery and glass and other small items are embedded in a “ground” that hardens. These small bits are used to comprise an image. 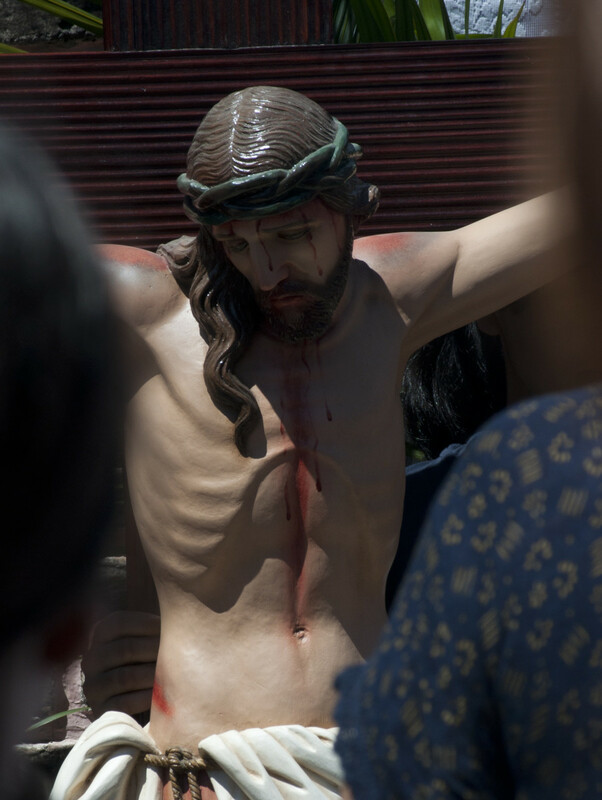 This process could be considered an early example of recycling and repurposing, as well as a fitting metaphor for our Lenten/Easter experience – the redemption of our broken world. Our butterfly is made from hundreds of small pieces of colored paper designed and arranged to make a pleasing display. The butterfly itself is a symbol of rebirth and resurrection. As always, our decorations are offered as a gift of love to our congregation and friends and as a reflection of our collective joy at the resurrection of our Lord! 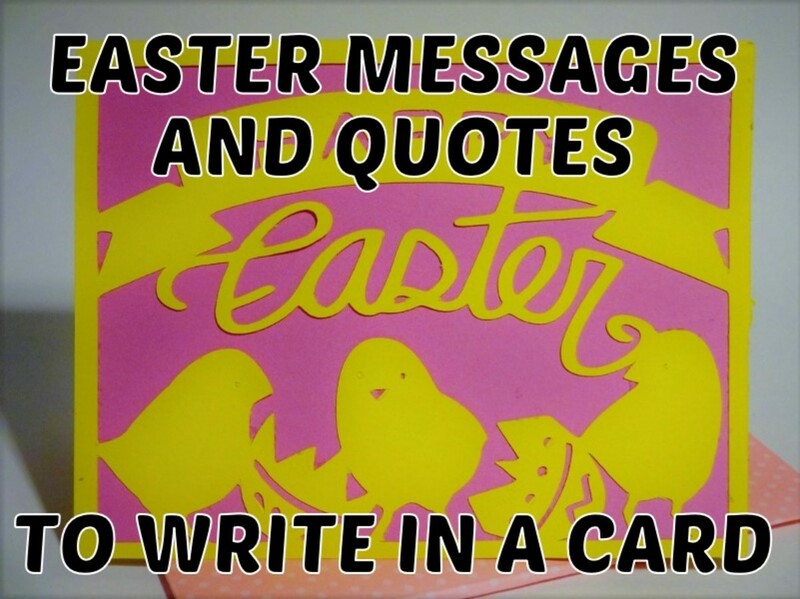 Happy Easter from the Trinity Lutheran Church Liturgical Arts Team. Thank you for your comment Anuska! I'm glad you enjoyed this. Honestly, love this post. You're so thoughtful. I really appreciate your effort.